I’d love to do a piece on the Crew team — there’s action, competition, harsh New England elements, and all the makings of an interesting visual project. 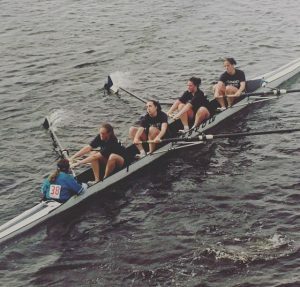 I would interview the captain, the rowers and the coach, take videos of them rowing, running and working together, and the main focus would be on the team’s upcoming showing at the Head of the Charles, which is the largest regatta in the world. That said, I am worried about conflict of interest, because I’m on the team. That wouldn’t fly in the real world, so I would completely understand if it doesn’t here, but if there’s a way to make this happen, I think it could be a really interesting topic. If not, I’ve been considering other topics, including something about the Swim team, but I’m not sure yet. If I do end up going Swim team, I could always interview the swimmers and coaches, and then get footage of their workouts and meets. It’s the same competitive atmosphere, with really dedicated and supportive teammates. I’m just not sure where the story would be going there. They’re not doing anything special now besides their regular season, but maybe that could be a good story? Willing to take any advice I can get. Hi Abby, with regard to your first story, I’m not worried about conflict of interest so much as your ability to both document and participate, if you’re a member of the team. Is this something you’d be able to manage? I imagine you’d be rowing during the Head of the Charles event, so how would you simultaneously shoot it if this is to be the focus of your piece? You’ve identified a few good interview subjects but what kinds of questions would you ask them? I see what you mean about the limitations of the swim team story. There is more drama built into your other idea, as you’d be able to shape that story around the anticipation of the Head of the Charles Event. Have there been any Justice articles written about the swim team lately? Perhaps you could use those to research the swim team, and maybe you’ll find that a story idea might emerge from that research.